Welcome to the WE Global Learning Center—WE’s international headquarters for service-learning, community engagement and youth programs. The facility is housed in a beautiful heritage-certified building that has been fully restored to its original 1908 and 1925 design intentions—one of only a few Chicago School of Architecture-style buildings in Toronto that have their original design intent intact. More than a workplace, the WE Global Learning Center is a community space that makes doing good doable for youth and adults in Canada and internationally. From the state-of-the-art facilities to the building renovation, the WE GLC was made possible entirely thanks to the targeted generosity of donors and companies that shared our vision of expanding our service-learning programs for young people, educators, families and more, and building an international hub for people who want to change the world. 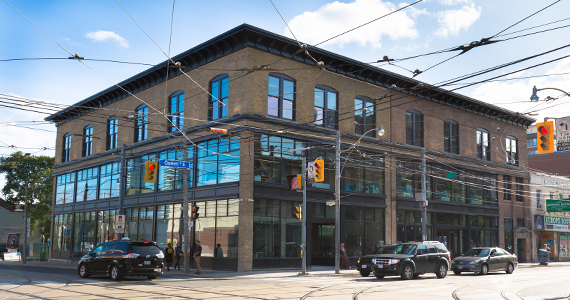 The WE Global Learning Center has been named Toronto’s nicest new office space by BlogTO, and has also been featured in the Globe and Mail and HELLO! Canada.